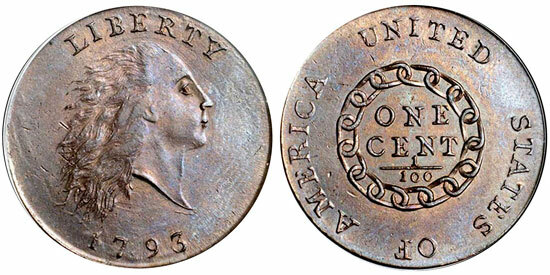 Without a doubt, the 1793 Chain Cent is amongst most famous and shortest-lived issues of American coinage ever produced. Struck during the first year of regular coinage production at the United States Mint in Philadelphia, its design was criticized in the year of issue, but has come to be cherished by modern collectors. While circulating examples of this historic rarity are available at more accessible price levels, the finest known example recently sold at auction for more than $1.3 million. All Chain Cents were struck during the early months of 1793, from late February (one source list Washington’s Birthday as a date on which the first coins might have been struck) until mid-March 1793. A reasonable number of coins were produced during this period before production was halted due to a shortage of copper. This was a problem which would haunt the early United States Mint in Philadelphia for many years to come, however, for the time being the United States had its first coinage of cents. The Chain Cent was supposedly designed by Henry Voigt although facts are scarce. As mandated by law, a visual representation of Liberty was portrayed on the obverse. The reverse featured a chain of fifteen links, representing each of the states in the Union at the time. The chain had been intended to indicate the strength of the Union, however some members of the public drew other connotations. Even in the late 18th century slavery was an issue in the United States, and the reverse design served as an unintended reminder of this. The representation of Liberty on the obverse was also criticized for its execution and her demeanor. While production was halted because of the copper shortage, a new design was prepared and would be introduced when production resumed. Despite its brief run, the Chain Cent holds an important place in the history of American numismatics and continues to captivate collectors. Unlike some of the other earliest coins struck at the United States Mint, we have a fairly good idea of the total mintage for the 1793 Chain Cent. A total of eight different deliveries were made, compromising five different varieties of the Chain Cent, with a total output of 36,103 coins. This might be a surprisingly high number for most people to understand, as the issue is usually considered to be a rarity. While the mintage is greater than some other early rarities, the demand is much higher than the supply at any given time. This is especially the case with choice specimens on problem-free planchets, which are extremely difficult to find. There is one variety (Sheldon’s NC-1, Breen’s variety #5) that is virtually impossible to find in any condition. Only four are presently known to exist and offerings are a true “once in a lifetime” opportunity. This variety can be identified by the spacing of the word LIBERTY on the obverse, which is wider than on any of the other known varieties. Sheldon, in his work Penny-Whimsy published in the 1950’s (the major reference on early large cents) denoted it as non-collectible, which remains true to this day. The four other varieties range from scarce to very scarce, but all are offered with some regularity. There are two entries in the Red Book (A Guide Book of United States Coins), one with the word AMERICA in full on the obverse while the other has it abbreviated to AMERI., which has been attributed by an engraving error when the first two words had been punched into the working die. That particular reverse die was only used on S-1, while all other die combinations used the other reverse die. Despite the low mintage and heavy circulation of these pieces it appears that some were saved, as a couple of high quality pieces exist. As can be expected, most of these have toned to various shades of brown, although an extremely limited number of chain cents still show a limited amount of red coloration. For a coin of this age, over 200 years, this certainly is nothing short of a miracle! PCGS has graded a single coin as a specimen striking, grading SP65. Struck from the earliest known die state, on a pristine planchet, with a superb strike, there is absolute no doubt that this particular coin is something special. 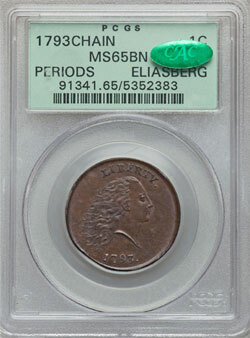 As for the regular mint state grades, the 1793 chain cent is an absolute rarity. PCGS and NGC both have graded only 1 or 2 examples each in the mint state grades 60 to 67. While both grading services differentiate the AMERICA and AMERI. varieties both are extremely difficult to acquire in high grades. Generally speaking Sheldon-1, the AMERI. variety, is less often encountered in high grade. This is certainly because of the lower mintage of this variety (only a single die pair, as mentioned above). Because of the demand for this issue by both large cent collectors as well as type set collectors prices are high. Any chain cent in AU or MS easily sells for six-figure sums. In January 2012, an example graded PCGS MS65BN sold for $1,380,000 at auction. XF graded examples sell for approximately $40,000, depending on the variety and the overall eye-appeal of the coin. Prices gradually go down in the lower grades but as an example a PCGS F-15 usually sells for about $20,000, give or take. Even barely recognizable examples with porous and corroded surfaces usually sell for at least $2,000. If such a coin is graded without problems by PCGS or NGC prices go further up from there. The ownership of a genuine chain cent has been prized by both beginning and advanced numismatists over the last century. Regardless of its general availability a genuine Chain Cent is a true treasure for the serious numismatist in all grades. With early copper in problem-free PCGS and NGC holder increasing more and more in popularity prices have gone up as well. While some people try to collect all of the four “collectable” varieties and sometimes even try to include the Sheldon NC-1, this is an extremely difficult task which easily can take a number of years.